The champion of the cattle section at this year’s Dounby Show, Skaill Estella. 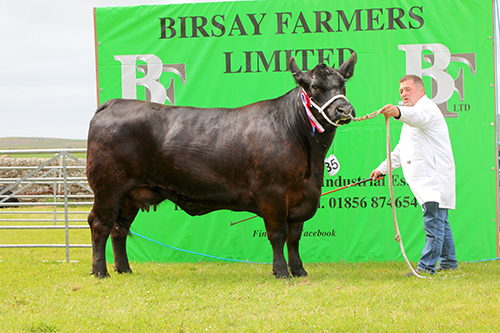 The title of overall winner at today’s Dounby Show cattle section has been awarded to a three-year-old pedigree Aberdeen Angus cow, shown by Messrs Davidson, from Skaill Farm, in Sandwick. A “delighted” John Davidson said the homebred cow, named Skaill Estella P117, was from the bull Blelack Blackrod and was out of a dam from the Diana family. The reserve prize went to a Shorthorn heifer shown by B. & S. Slater, of Newbigging, in Dounby. The April 2015-born heifer, is named Greenburn Julie and is from the bull Chapelton Delegate and out of a dam named Greenburn Cassie. The animal was bought in June 2015 from Eric Heddle, East Moaness, Lyness. Today’s cattle judge for both the Aberdeen-Angus and Shorthorn breeds was Hamish Sclater, from Turriff. He commented: “I knew fine I had two good champions when I was judging the sections.